There are a pretty good number of art galleries in Pioneer Square and one of the more popular activities in downtown is to check out all the different types of art that can be found. It seems that every major city in the United States (along with even some of the smaller ones) are really trying to promote their local artists. I've been to art walks in Honolulu, the East Coast and in between, but it wasn't until recently that I found out that the birthplace of the art walk is actually right here in Pioneer Square. 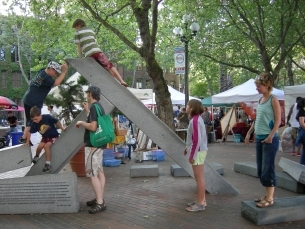 The Pioneer Square art walk actually started in 1981 when a group of art dealers wanted to promote some local work. They printed out some walkable maps and painted footsteps on the sidewalks outside some of the galleries. Well, this first art walk eventually turned into a monthly activity that just grew and grew, and soon became known as the 1T Art Walk since it was held on the 1st Thursday of the month. What started out as a small experiment has now become a pretty popular monthly activity. Most of the galleries open from noon to 8PM so that people can have plenty of time to check out all the venues. Some galleries, however, open up a bit later so that they have plenty of time to get ready for the event. Most of the time, the galleries use this time to introduce the public to some of their new exhibitions and artists, so if you're interested in art, this is a great time to check out the local art scene and artists. One of the cool things about the 1st Thursday Art Walk in Pioneer Square is that not only are there a number of different venues with different types of art, there are also plenty of public art installations that are located on the walking paths between these galleries. In addition to the public art exhibits, there are also plenty of art and craft booths set up where you can browse and shop for all kinds of cool things to take home with you. So if you're going to be in or near Pioneer Square on the first Thursday of the month, be sure to check out the official First Thursday website and accompanying printable map. You'll be able to see a list of all the art galleries in Pioneer Square and you'll be able to print out a pretty good walking map that will give you an idea on how to see all the galleries. You won't want to miss it! Back from galleries in Pioneer Square.